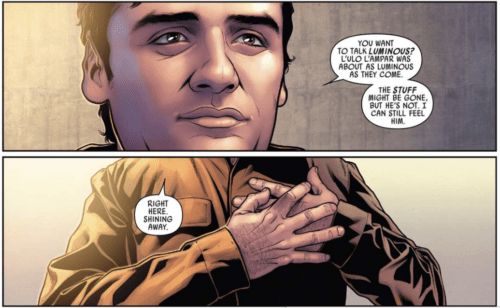 REVIEW: Star Wars: Poe Dameron #14 – "Luminous Beings Are We"
The Black Squadron mourns the loss of L’ulo, and General Organa challenges Poe to look at his own role in the Resistance. Meanwhile, Terex must prove his usefulness to the First Order or suffer the consequences. Plot: Back at the Resistance base, the Black Squadron attends a funeral for L’ulo but Poe still struggles to process his grief. Instead of focusing on the next adventure, this book takes a step back to examine the emotional toll of the war going on. Terex’s return to the First Order does not go as planned, and instead of being welcomed as a hero he is dismissed as offering no value. In the end, Captain Phasma decides there might be a way to redeem himself after all. 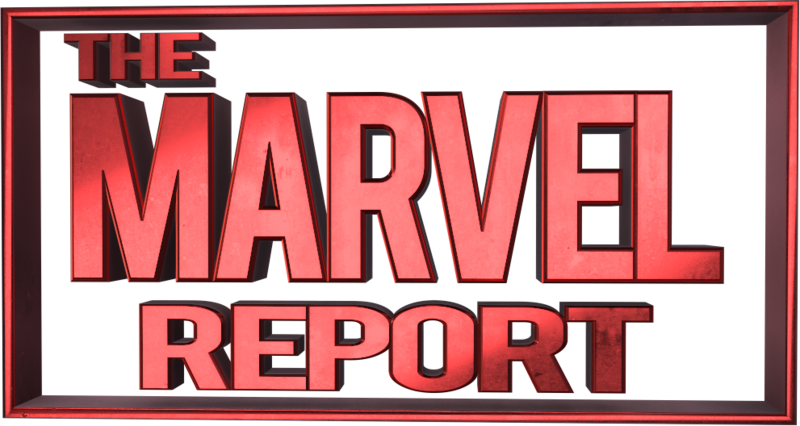 Story: After the action-packed arc of Black Squadron vs Terex, writer Charles Soule takes a step back for an issue of reflection and character exploration. Soule starts the issue strong with a great speech from Poe during L’ulo’s funeral about the Force and a story about an unnamed Jedi (Yoda) who told Luke about how “luminous” we all are. In addition to allowing the characters to look at their own grief, this scene serves as an additional tribute to the late Carrie Fisher. Soule tweeted in December that he wanted this scene to be in her memory. While the scene packs an emotional punch even without this knowledge, the idea that like L’ulo she lives on, shining, adds extra weight to the issue. 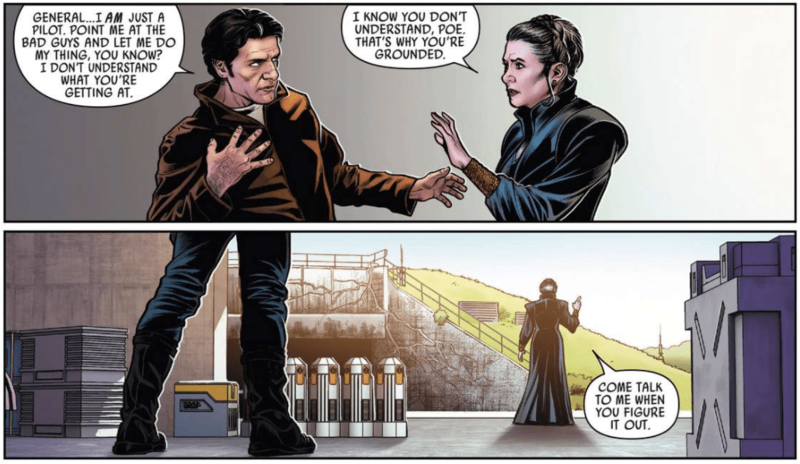 Soule continues throughout the issue to dig deeply into what it means to Poe to belong to the Resistance as General Organa forces him to think about what it is he has to offer. 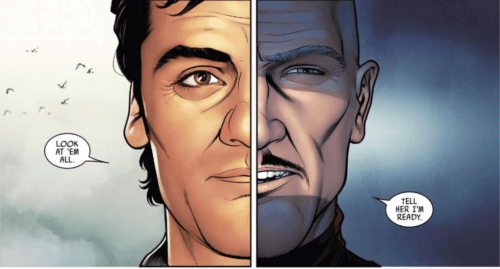 In a meta parallel, just as there is more to Poe Dameron the comic than fighting and action, there is also more to Poe the character. Leia reminds him he is not just a great pilot, but someone who inspires others to fight. Hope is an important part of what Star Wars is all about, so I enjoy seeing Soule tackle it in this comic. Meanwhile, we get a parallel development from Terex who exhibits the same level of devotion to the First Order as Poe does to the Resistance. By comparing the two characters, and seeing just how similar they are, Soule does a great job of looking at the complexity of war and how right and wrong often comes down to individual interpretation. Art: I can’t think of a better choice than bringing back Angel Unzueta (Star Wars: Poe Dameron #7) for this issue. While Phil Noto does an excellent job on the book, Unzueta’s drawings provide a rich emotional depth needed to fully convey the tone of this issue. The early scenes where Poe gives a speech at the wake show a detailed level of expression to the extent where you can see the sadness in Poe’s eyes. The richness of detail works beautifully in an issue that spends so much time on the characters instead of action sequences. Arif Prianto introduces contrasting color palettes for Poe (warm) and Terex (cool) to intimate they are two sides of a coin, light and dark. This theme is driven home by the side-by-side panels of art Unzueta draws for the two loyal soldiers. Verdict: Whether you are a fan of just this book or of the Star Wars universe as a whole, this issue is a can’t miss. 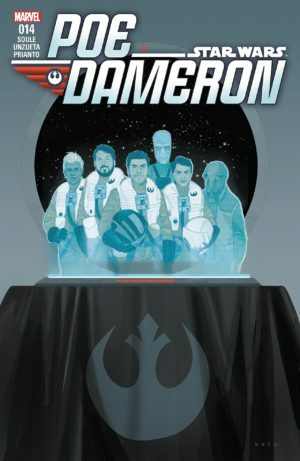 Star Wars: Poe Dameron #14 hits the mark on how to produce an issue that lacks significant action but doesn’t feel slow or pointless for the reader. Instead, this issue offers an emotional journey for the reader and allows them to look at the meaning of the Resistance. The subtle tribute to Carrie Fisher makes it an especially touching issue for fans of the franchise and may have made at least one reader cry (which would be me). May The 4th Be With You – Rogue One Commentary!